Published today in the open-access journal GigaScience is an article that presents the genome of the tegu lizard, which has mastered a trick that is highly unusual in the reptile world: it can turn on its own heating system. Most reptiles are not able to control their body temperature like mammals do and instead must rely on its environment, such as available sun and shade, to attain an optimal body temperature. The tegu, Salvator merianae, however, has taken a step towards being full-blown warm-blooded: It can raise its own body temperature by up to 10°C above its surroundings. Another, but more negative, aspect of the tegu is that is an invasive species and poses a serious threat to endangered species. Although it is a native of South American rain forests and savannas, the charismatic nature of the tegu— and that it can even achieve some level of house training, makes it an extremely charming pet that is much beloved by reptile aficionados. Unfortunately, international trade in exotic pets are one of the primary reasons that species enter new environments where they can become a menace to the native species. 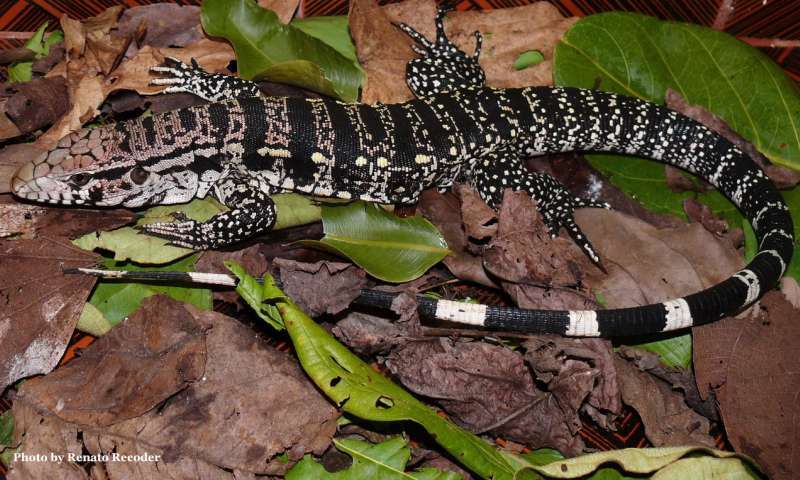 Given the tegu's unique biological characteristics and its potential peril to the environment, the availability of an extremely high-quality genome sequence of this large lizard serves as a rich resource for identifying and analyzing the underlying molecular basis of these aspects. The tegu genome sequence, provided by a team of researchers led by Michael Hiller at the Max Planck Institute for Molecular Cell Biology and Genetics in Dresden (Germany), is of unprecedented quality. To accomplish this the researchers used state-of-the-art technology to read the tegu's DNA and assemble its genome sequence. The newly released genome sequence of S. merianae is more than two billion DNA letters long and contains more than 22,000 genes. It is the most complete assembly of any reptile genome so far and will also aid scientists to study other lizards and snakes. By using so called "long read" (Pacific Biosciences) sequencing technology, the researchers were able to overcome some of the challenges of assembling reptile genomes. 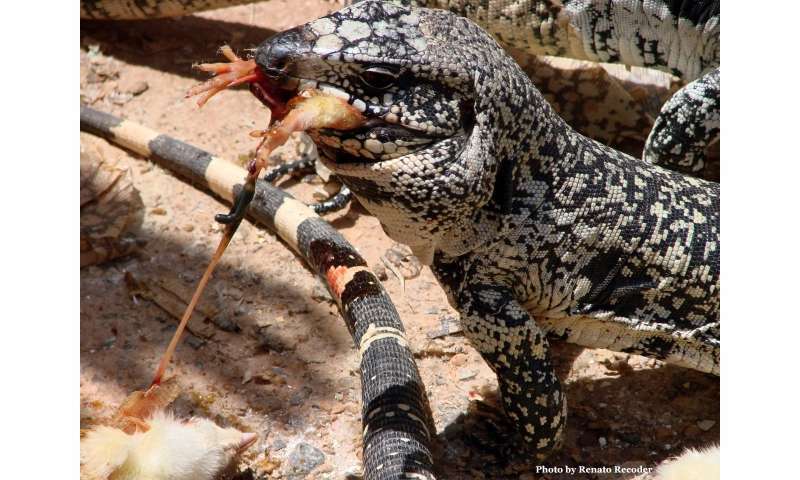 Hiller and first author Juliana Roscito explain: "Similar to other reptiles, a large portion of the tegu genomes consists of repetitive sequences, which occur many times in the genome. Repeats are a main problem when assembling a genome, especially when repeats are longer than the length of the sequenced DNA fragments, which results in gaps (breaks) in the assembly." The tegu is emerging as an interesting model species in its own right. One of the motivations for the authors to sequence the tegu genome actually related to their interest in another group of reptiles: snakes. The authors explain what they had in mind: "We were interested in studying limb loss in snakes and other reptiles. Since limbless reptiles had ancestors with fully developed limbs, we needed a well-assembled genome of a lizard with fully developed limbs as a reference." Given that there are few reptiles with sequenced genomes, the authors decided to produce this themselves. Another component of the article, especially given that reptiles are under-represented among. the vertebrates with sequenced genomes, the authors also provide a whole-genome alignment between the tegu and 16 other species. "We hope that these resources facilitate comparative reptile genomics to understand how unique morphological features evolved in this group of species and how vertebrate genomes evolve in general", Michael Hiller and Juliana Roscito conclude. Do lizards dream like humans?